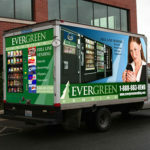 Evergreen Vending, headquartered in Tukwila, Washington, is a full-line vending company that operates 50 vending and OCS Routes throughout Washington and Oregon. Jim Brinton, President of Evergreen Vending, started the company with one single machine in 1976 while he was still in high school. From this small beginning, Brinton has grown the company to include three branches, a depot, and a vending machine distribution company. “When we were a smaller operation, I knew all my employees. As the company grew, I was no longer able to do that as well as I would have liked. I began to feel I was losing hands-on control.” says Brinton. They had incidences where ex-employees used duplicated keys to help themselves to company money. Also, Brinton wanted to change his employees from hourly wage to commission. But, before doing so, the company had to control who accessed their machines and when, so they could protect their commissioned employees’ income. Brinton first saw CyberLock at a tradeshow and later talked to a vending operator that had installed CyberLock. In July, 2003, Brinton committed to installing CyberLocks on all of their vending equipment. Implementing CyberLock was quick and easy. Their drivers installed the CyberLocks as they serviced their routes. Today, Evergreen has CyberLock on 100% of their 6,000 machines and on entrances to their office buildings and warehouses. Each branch manages its own CyberLock system. The branches are networked together so corporate headquarters can view the audit trail from the CyberLocks and keys from any location. “CyberLock is a great deterrent. It gives me peace of mind knowing exactly when someone has accessed any piece of equipment in my operation. The system really put some accountability into place that we did not have in the past,” says Brinton. CyberLock has allowed them to take back control of their machines. “In an industry like ours, we have to watch the cash and have accountability. I share my CyberLock experience whenever I get the opportunity because it provides these very important controls for my business,” affirms Brinton. Click here to learn more about CyberLock applications for Vending. "In an industry like ours, we have to watch the cash and have accountability. I share my CyberLock experience whenever I get the opportunity because it provides these very important controls for my business."